Broad market data do not always capture the reality of the real estate market. National data do not necessarily reflect local market conditions. Even metro data does not necessarily capture deep divisions among micro-markets. Miami is especially fertile territory for such local divisions to sprout. According to the U.S. Census, Miami-Dade County is second only to New York County (i.e., Manhattan) in income inequality. Hot properties and neighborhoods are also a magnet for international wealth. If location matters in real estate, it really matters in Miami. So perhaps it should come as no surprise that the past year’s rebound in Miami home prices has been very unevenly distributed. The most desirable areas have seen prices regain almost all of their losses, while most of Miami remains deep in negative territory. 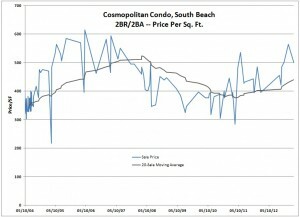 For the sake of comparison, consider the Cosmopolitan Condo in the trendy SoFi neighborhood of Miami Beach. SoFi is the part of South Beach that lies south of Fifth Street. 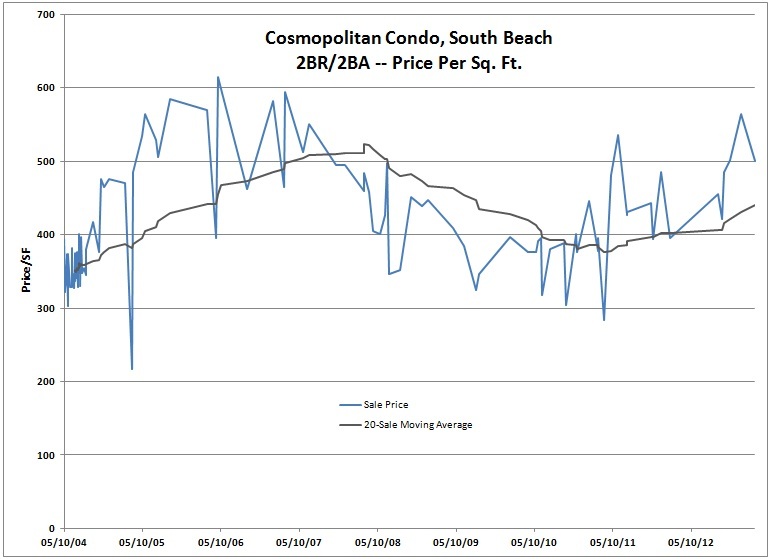 The Cosmopolitan, built in 2004, is not even a high-end property, yet buyers have recently been willing to pay roughly the same amount that buyers paid at the top of the market in 2006. Only 6 of the 223 units in the building — about 2.7% — are in some stage of foreclosure. Compare that with Snapper Village, a community located in the heart of southwest Miami-Dade County. Prices went parabolic during the boom and collapsed in the bust. The past year’s bounce has hardly begun to recoup the losses. 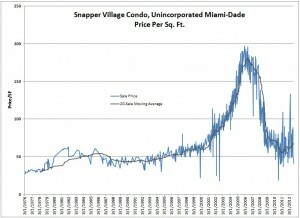 At Snapper Village, 64 of 636 units — over 10% — are in some stage of foreclosure. posted by // This entry was posted on Friday, April 12th, 2013 at 9:00 am and is filed under Properties in Focus, Real Estate Market Data. You can follow any responses to this entry through the RSS 2.0 feed.